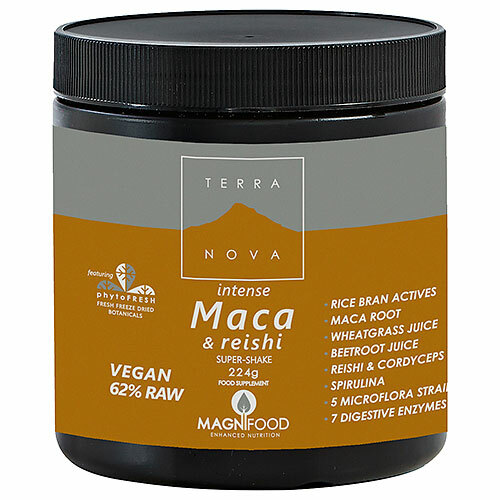 Magnifood Intense Maca & Reishi (Mushroom) is a deeply nourishing, intensely synergis- tic blend of Rice Bran Actives, Maca, Wheatgrass & Beetroot juices, Reishi & Cordyceps, Spirulina, Probiotics and Digestive Enzymes - plus the equivalent of a 28ml wheatgrass juice shot in every serving. Rice Bran Actives - Providing more than 100 known antioxidants, beta glucans, tocotrienols, phytosterols, vitamins, minerals, carotenoids, CoQ10, alpha lipoic acid and more. Maca Root - Providing protein, vitamin C, B vitamins, potassium, calcium, iron, copper, zinc, plant sterols and many other compounds. Wheatgrass Juice - Providing chlorophyll, vitamins, minerals, antioxidants and enzymes. Each serving provides the equivalent of a 28ml wheatgrass juice shot. Beet Root & Greens Juice- Providing betalains, trimethylglycine, nitrate, vitamins (especially folate) and minerals (especially manganese). Reishi - Providing beta glucans, triterpenoids, sterols, nucleotides, peptides, and much more. Cordyceps - Providing polysaccharides, sterols, nucleotides, proteins, cordycepin (3’- deoxyadenosine), cordycepic acid (D-mannitol), vitamins and minerals. Spirulina - Providing chlorophyll, phycocyanin, carotenoids, highly digestible protein, vitamins and minerals. Probiotics - Providing five of the most heavily researched strains of microflora, and utilizing technology which achieves optimal viability and digestive stability. Digestive Enzymes - Providing an array of digestive enzymes which have been shown in research to be stable and functional within a wide pH range in the digestive tract. As a food supplement for adults, take one scoop daily (approximately 8g) mixed in juice; rice milk, almond milk or coconut milk; or blended into a smoothie. Do not exceed dosage unless recommended by a healthcare practitioner. For optimal stability of the probiotics in this product, after opening store between 4-8 Degrees Celsius or refrigerate. Below are reviews of TERRANOVA Intense Maca & Reishi Super-Shake - 224g by bodykind customers. If you have tried this product we'd love to hear what you think so please leave a review. 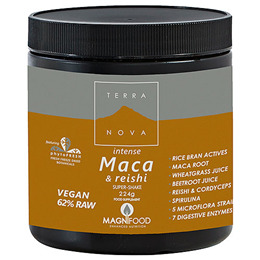 Magnifood Intense Maca & Reishi (Mushroom) is a deeply nourishing, intensely synergis- tic blend of Rice Bran Actives, Maca, Wheatgrass & Beetroot juices, Reishi & Cordyceps, Spirulina, Probiotics and Digestive Enzymes.